Kano State Hisbah Board on Friday said it had arrested eight young girls allegedly involved in prostitution in the city. The News Agency of Nigeria (NAN) reports that prostitution is banned under Sharia law in Kano State. Malam Nasiru Isa, the board’s Assistant Commander-General, Operations, told NAN in Kano that the suspects were apprehended on Thursday evening at Rijiyar Zaki bus-stop during a special patrol. “All the suspects are females of between the age of 22 and 23,” he said, adding that the arrest followed a tip off. 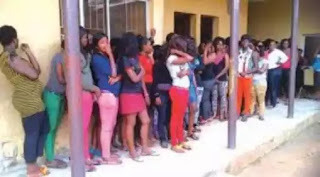 According to him, the eight girls live in an uncompleted building at the bus-stop which they allegedly turn into to a brothel. 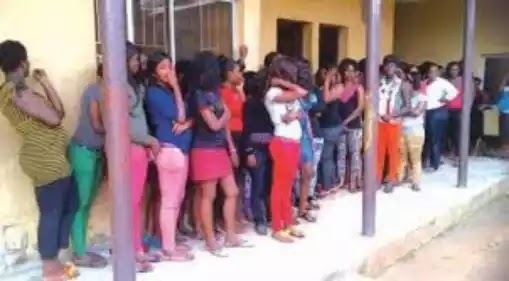 “Our men went there around 5:00 p.m. on Thursday evening and arrested eight suspects at the Bus stop,” the official said, stressing that they would be properly screened and taken to court. The official noted that most of the suspects were from broken homes and called on parents to ensure proper upbringing of their children to enable them grow up as responsible citizens.